We have been enjoying lovely weather with temperatures in the low 70's and sunny skies for the most part. Because of that, the Cape Coral Festival of the Arts was a big success this year. The Cape Coral Festival of the Arts happens every January with over 300 artists and craftsmen. A portion of Cape Coral Parkway is shut down and we like to go and stroll down the street checking out all the booths. You will find paintings, photography, jewelry, sculpture, and many types of crafts. People are encouraged to bring their pets and there are activities for them and for kids. There are also food booths, and live music playing. It's a very pleasant way to spend the afternoon and this year the weather cooperated by being warm and sunny. We usually wrap it up with going out to dinner with our neighbors. To read more and see more photos, go to my website page about the Cape Coral Festival of the Arts. Morettis Italian Grill opened last year and I had requests about it so I decided to go and find out for myself. It's a little confusing, but there was a Moretti's in Matlacha that had been owned by the Cape Coral's owners that is now called Toucan. There is also a Moretti's in Ft. Myers, that is owned by the Cape Coral's owners' son. I thought the food was very good. I had a delicious shrimp appetizer and the Seafood Alfredo for my main course. 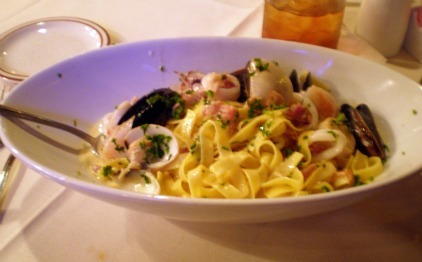 The seafood included shrimp, scallops, lobster, clams, mussels, and calamari in a cream sauce. I got a kick out of this ...... I also had a tiny octopus in my seafood pasta. I tried a leg but was too chicken to eat the rest .......maybe next time I'll be brave enough to eat the whole thing! The service was a bit lacking, but it was our waitress's second night on the job and the restaurant was packed, busy, and noisy. The owners are German, and I had a chance to chat with them a bit. Mrs. is quite the character! Go to my new page for more info and photos about Morettis Italian Grill. UPDATE SEPT 2012: Morettis is no longer in business. I thought I had found the best burger in Cape Coral when I bit into the juicy, tasty bacon cheeseburger at Paradise Deli. But, the deli got new owners and they skimped on the burger and fries that came along with it, and it just wasn't the same. I liked the burgers at 5 Guys, and recommended them for awhile, but didn't want to recommend a national chain. I had heard that Paradise got new owners again, and I'm happy to say that the burgers are just like they used to be! Not only that, you can sit outside for breakfast, lunch or dinner. Burgers aren't the only item on the menu, there is a variety of hot or cold sandwiches. And, if you like, you can order from some of the deli's beer or fine wines. 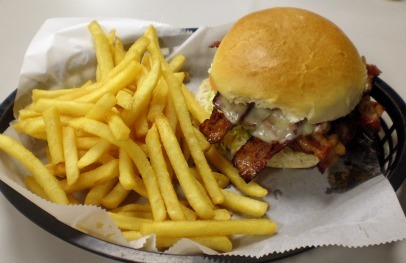 There's nothing like a bacon cheeseburger at Paradise Deli. While in Cape Coral, have you needed a ride to or from either of the airports in Ft. Myers or Punta Gorda? We did, when we flew back north for the holidays, and we used Ron's Airport Transportation. Ron will drive you in comfortable, non-smoking Lincoln Towncars to the airport. He will help you with loading and unloading your luggage, you don't have to worry about driving through traffic, and it may be less expensive than parking your car at on-site or off-site airport parking lots. To find out more, etc, go to Cape Coral Airport Transportation. Have fun and don't forget to Contact Me. Now for the Pic O' the Month. We are lucky to have a west-facing lanai and enjoy watching the sun set every night. 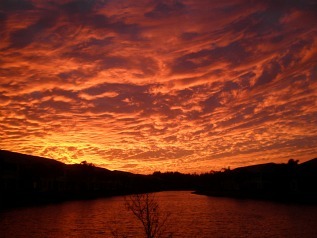 We have many spectacular sunsets in Cape Coral, but this past month there was one that was different from the others. The clouds looked like they were curling like ocean waves. My photo doesn't do the real thing justice, but I hope you can appreciate it anyway.